Blurb: The body of a disgraced college lecturer Gavin Miller is found on an abandoned railway line by a woman out walking her dog early one winter morning. In the four years since Miller’s dismissal for sexual misconduct, he’s been living like a hermit, listening to music from his college days and existing as frugally as possible on the outskirts of a small village. So where did he get the five thousand pounds found in his pocket? Review: I received a copy of this book for free for review purposes in conjunction with a blog tour, all opinions expressed below are my own. 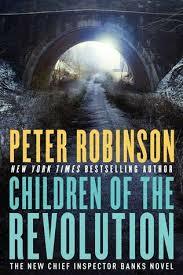 I read and reviewed my very first Peter Robinson book just last month, Watching the Dark. I enjoyed it quite a bit. Enough so that it made me want to sign up for the blog tour for this most recent installment in the Inspector Banks series. Overall I liked this one quite a bit. There were a few more revelations regarding the main characters that gave a little bit more insight into their backgrounds. Since I’m not likely to go back and read the entire backlist (hey, 19 books is a lot to commit to), I still have a lot of questions, but things are starting to make a bit more sense the more I read. As I stated in my review of Watching the Dark, this book is not necessarily a page-turner, thrill-a-minute book. Instead it is meant to be savored. The writing sucked me in and I was entirely wrapped up in what was going on. As I felt with the previous book, I so enjoyed working the case with Banks. I did have one issue, though. The ending. The way that it occurred (no spoilers), well it just didn’t sit well with my opinion of Inspector Banks’ character. I can’t imagine that he would let things end the way it did. Maybe it’s a sign of what’s to come in future books (that promotion? ), but for whatever reason it didn’t feel right to me. Obviously, having only read two of these books, I’m no expert on Banks’ character, it just felt off to me. All that aside, though, I would definitely recommend this book. I thoroughly enjoyed it and am definitely looking forward to the next Inspector Banks installment! I don’t think that I have heard of this author. What is it about me that is so addicted to series? I love the thought of a big series like this. It makes me want to go find the first book and get started 🙂 Great review!